National Pet Dental Health Month is here! If your pet is in need of a dental cleaning, you can take advantage of our dental special this month. We are offering 20% off dental cleanings during the entire month of February! 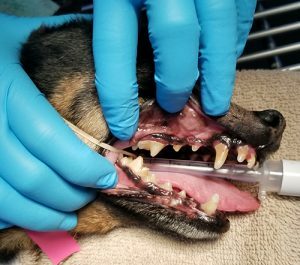 Dental cleanings are one of the most common procedures we perform on dogs and cats at Lawndale Veterinary Hospital. For this week’s blog, we want to put the spotlight on dental cleanings by sharing a recent dental story. Meet Lola Giles. 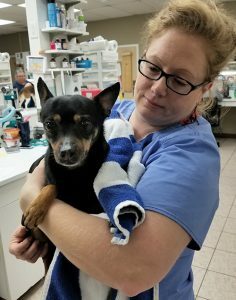 She is a 7-year-old Miniature Pinscher full of energy, sweetness, and love. Dr. Waterman recommended that Lola’s owner pursue a dental cleaning due to heavy tartar buildup on Lola’s teeth. Dr. Waterman felt it was important to not only clean the teeth, but also be able to perform a thorough oral examination under anesthesia. Left untreated, dental disease can progress and cause gingivitis, mouth pain, bleeding, infections, bad breath, loose teeth, problems chewing, weight loss, and even behavioral changes. Lola was dropped off at Lawndale Veterinary Hospital on the morning of January 24th, 2019. Her owners had been instructed not to feed Lola that morning since she would be going under anesthesia. Lola was a little nervous, but she settled in the treatment area well. 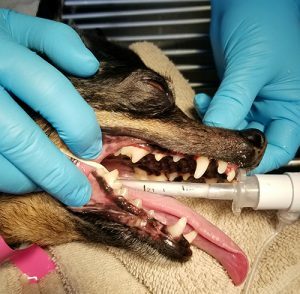 Prior to the dental cleaning, Dr. Waterman performed a thorough physical examination and ran some bloodwork to make sure Lola seemed well enough for the anesthesia. Her bloodwork looked great and her physical exam did not reveal any new problems or concerns (other than her dental tartar). An intravenous catheter was placed, and Lola was given injectable medications to start the sedation process (we call this ‘pre-medication’ because it comes before the anesthesia). Once Lola started getting sleepy, she was placed under full anesthesia. An endotracheal tube (a breathing tube) was placed so that Lola could be connected to the anesthetic machine where she could breathe a mixture of anesthetic gas and oxygen. Lola’s teeth were scaled and polished. She did have some mild gum recession around her incisors that was treated, but she did not need any extractions or additional dental treatments. Lola’s dental procedure lasted about 30 minutes. 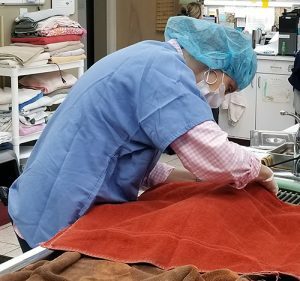 Since an animal’s body temperature can start to go down during anesthesia, our team kept her wrapped in blankets to stay warm during the procedure. As Lola was waking up from anesthesia, she was also placed on a warm air blanket designed for anesthetic recovery. Lola’s recovery was very smooth, and she was ready to be discharged that same afternoon. She was a little sleepy still, but she was up and moving about. Lola’s owners were instructed to feed her half of a normal meal that evening since anesthesia may cause stomach upset. The following morning, Lola was not quite back to her normal level of energy, but by that evening she was back to her old self! Lola’s dental story is a great example of how a typical dental procedure will go in the clinic. Now, her teeth look great and her gums are healthy. While she may need a dental cleaning again sometime in the future, her owners can also use home dental care techniques to help fight future tartar build up. Do you have a dog or cat with bad breath or tartar showing up on the teeth? Then schedule an appointment to talk with one of our doctors about the best dental health strategy for your pet!